Masque Bar makes some amazing face masks, so I was quite excited when I got a chance to try out their eye patch masks - the Masque Bar Hydro Gel Eye Dark Spot Eye Patch. That's quite a long name, but these are quite simple, easy-to-use patches/masks for the undereye area. Each box contains 30 pairs of these patches - so it's a month's worth if you use it every day as recommended - and a small plastic spoon/spatula is included to pick up the patches. Masque Bar claims these patches, which are soaked in an essence which includes among other things snail secretion filtrate, helps with smoothing and plumping the undereye area and reducing the appearance of dark circles. Scroll on to know more about this interesting undereye treatment. 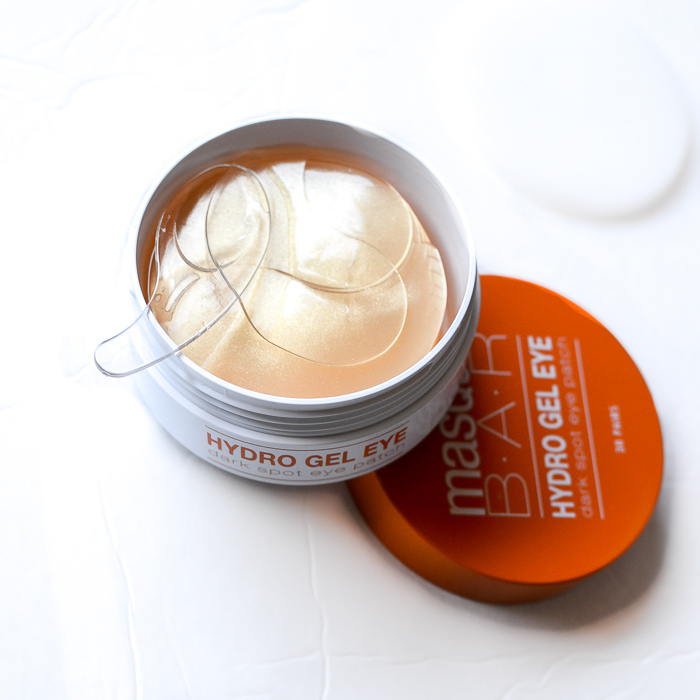 Masque Bar Hydro Gel Eye Patch - 30 pairs of gel eye patches stacked neatly in the tub. Use the spoon to pick up each patch - helps with keeping the rest of the product clean, plus it's a lot easier to pick up the slippery patch with the spatula than with fingers. 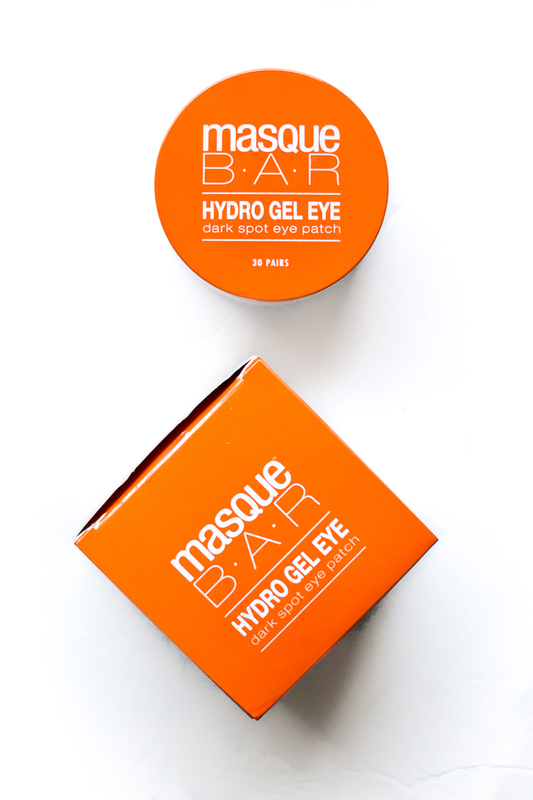 The Masque Bar Hydro Gel Eye patches are housed in a tub, 30 pairs stacked over each other, with the masks soaking in essence/concentrated serum. Each of these masks is a transparent, flimsy, crescent-ish shaped patch that you pick up with a nifty plastic spatula included in the package. To use, place the patch under the eyes, smooth out any wrinkles or bubbles to help the mask contact the skin properly, and relax for about 30 minutes. I tried to walk around with these on and they do tend to slip down, so I have to lie down while using these. The patch/essence has a pleasant citrusy smell to it which I go nose-blind to once the mask is applied, and the patch feels quite cool under the eyes. Even if it did nothing else, I would use these just for how relaxing it feels to put these on and lie down for a while. Any serum that's left behind after the patches are removed can be patted into the skin, and it absorbs easily without feeling heavy or leaving any greasy film. These patches leave my skin look healthy, and I do feel the dark pigmentation under my eyes looks a little lighter after a few days of regular use. It is recommended to use these masks every day for 30 days for best results, though I think you can get away with using about 3-4 times a week and still get good results. 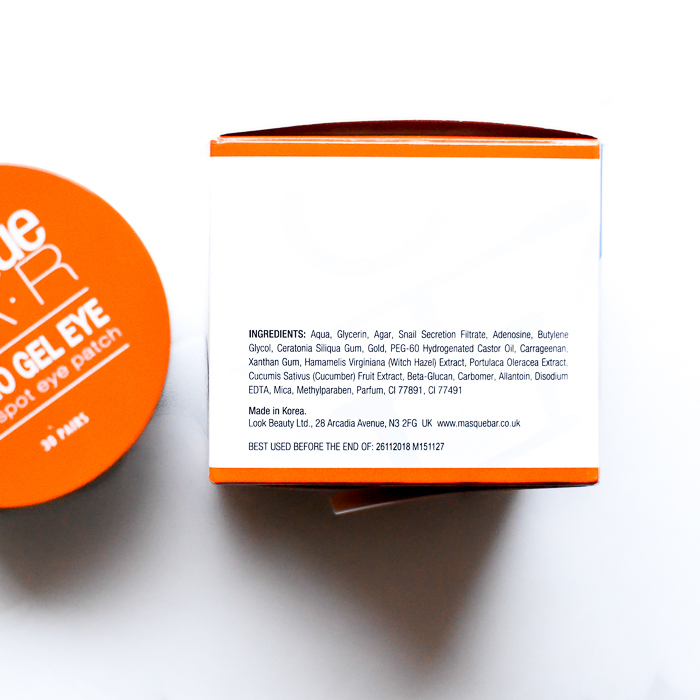 Masque Bar Hydro Gel Eye Patch - To use, smooth the patch into place under the eyes and lie down and relax for 20-30 minutes. I have quite a bit of dark pigmentation along my eye area, with the hyperpigmentation most prominent along the inner corner. It's a combination of heredity (always blame it on the genes first) as well as allergies. There is also some creasing which adds to the appearance of the hyperpigmentation. 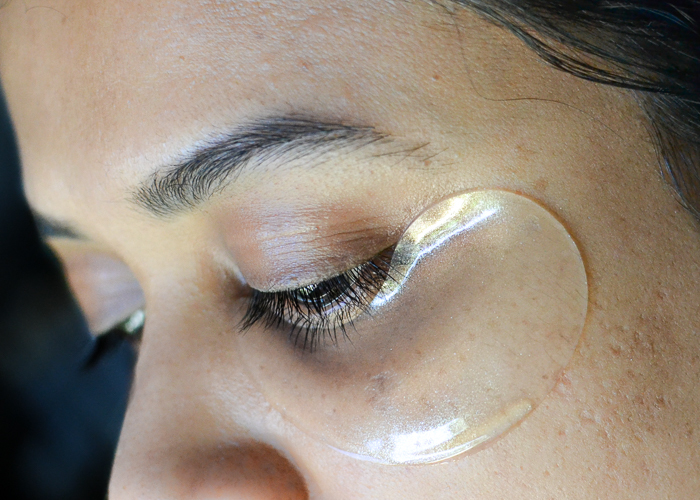 While the Masque Bar Hyro Gel eye patches cannot possibly cure all these issues, I do find that they add some moisture to the undereye area and overall give an appearance of smoother and brighter looking skin. I like to use an eye cream first and then place these masks over that - it helps the cream absorb better into the skin and boosts the overall effect of the mask - though the patches do work quite well when used on their own too. I have not had any irritation or skin reaction with using these patches under the eyes, though I did have some very slight irritation initially over my cheek bones (it's an area where I have extra sensitive skin that gets irritated even with the slightest sun exposure), but it's not enough to be an issue and lasts barely a minute. Warnings (as listed on product packaging) - Avoid using on blemishes, pimples, irritated, or sunburned skin. Avoid using on skin which is sensitive to bandages, tapes, or peel-off masks. Avoid contact with eyes. In the even of eye contact, rinse with water. Keep out of reach of children. For external use only. 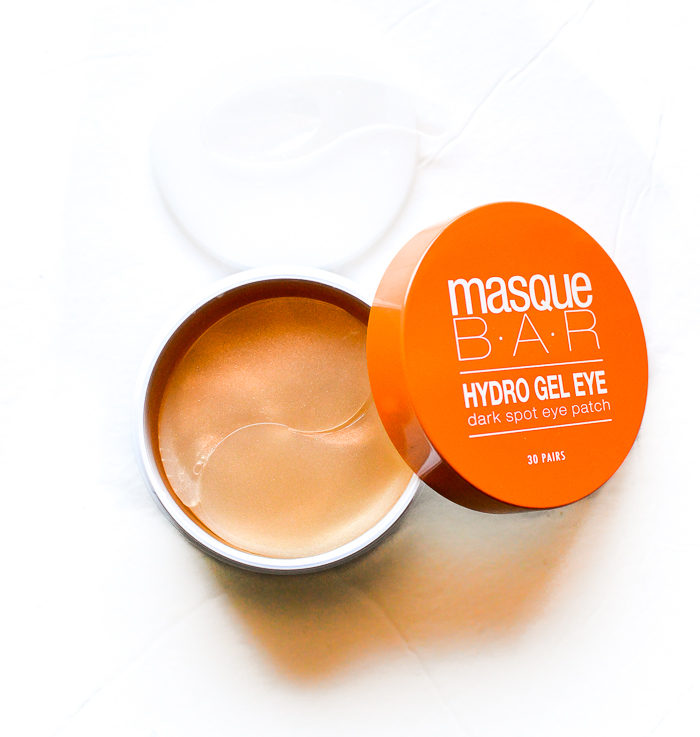 Overall, the Masque Bar Hydro Gel Darkspot Eye Patch is an easy-to-use simple mask for the undereye area that leaves skin moisturized and looking smoother and healthier. The brightening effect is more noticeable with continuous use, and the plumped healthy effect lasts a couple of days between uses (when used about 3-4 times per week). I love how cool and relaxing these masks feel and would definitely use them all summer just for the cooling effect. Also seems like a good product to try on my next long-haul flight - they are clear patches and not very noticeable under the eyes, so I could use them without worrying about scaring too many people. Product featured in the post was provided for review.